There’s a new idea for fixed gear riders that’s just so devastatingly simple, I can’t figure out why this isn’t a standard already. Instead of relying on the traditional thread-on fixed cog and lefthand thread lockring, why not use a 6-bolt disc brake mount for the fixed cog? 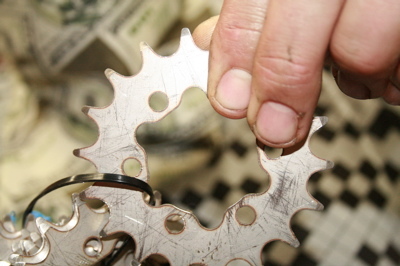 Of course the old style is faster for swapping gearing in between races at the velodrome, but the vast majority of street fixie riders hardly ever change their cog tooth count. For them, the greater worries are either the cog loosening during frequent skids or seizing to the hub after long term use, or the threads of the hub being stripped out. A 6-bolt, using good quality hardened steel bolts (allen head; forget about torx head) eliminates those worries. While other hub companies are racing to develop their own proprietary splined cog systems (Sugino, Miche, and Chub apparently), the 6-bolt is a simple design that is open to anyone. 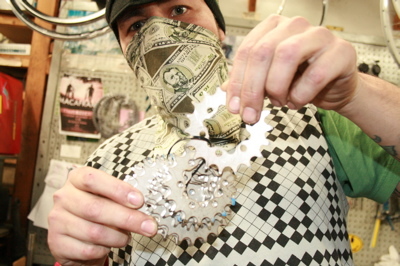 Enterprising individuals have started creating cogs to fit disc brake hubs already. You can talk to Daood at Metro Track Goods about getting some from his last batch. 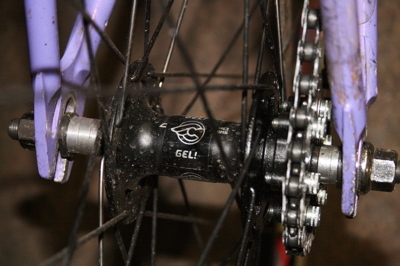 One limiting factor for 6-bolt cog use is the lack of specific track hubs (120mm spacing) to fit these cogs. 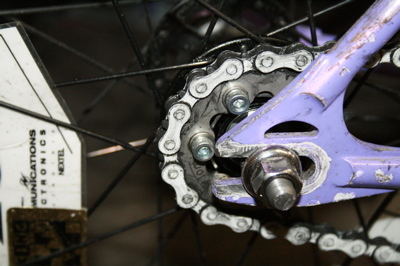 The current hot mod is to use a recent Shimano XT front disc hub (not Centerlock splined mount). That hub uses a 10×1 axle that is machined down at the ends to 9mm. One need only replace the original axle with a 10x1mm solid rear axle while keeping the stock cones and locknuts with the addition of 20mm total axle spacers. Voila! Works like a charm. The flange width is wider than some conventional track hubs (though narrower than others), and the chainline is almost perfect too.